I am in the process of reviewing one of the best eBooks about easily making money on the internet. It was put together by long time internet marketing expert – Willie Crawford and members of The Internet Marketing Inner Circle. I’ve read a few of the “20 Ways to Make $100 a Day Part-Time on the Internet” and they are solid. Each one is written by an recognized internet marketing expert that has real life pratical experience making money online. Click here to visit the website! After the book was created, a panel of online business experts reviewed each chapter and put it through “real-world” test to issure that the “average person” could actually make any one of the strategies work. I’ve also reviewed them to make sure that they are simple, proven and easy to setup. If you are just getting started and looking for a way to make at least $100 a day part-time, then I recommend that you buy this eBook for $27. It is definitely worth it! If you have already mastered the art of making $3,000 per month or more, then this eBook will help you expand to the next level. 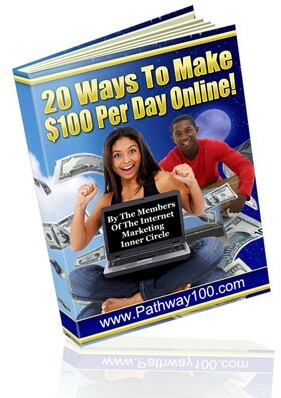 Here’s the link to the website: 20 Ways to Make $100 a Day Part-Time on the Internet! After you download it and read a few of the chapters, give me a call at 336.790.4123 or drop me a line – online contact form.